We don’t always associate a small and simple house with charm and serenity. 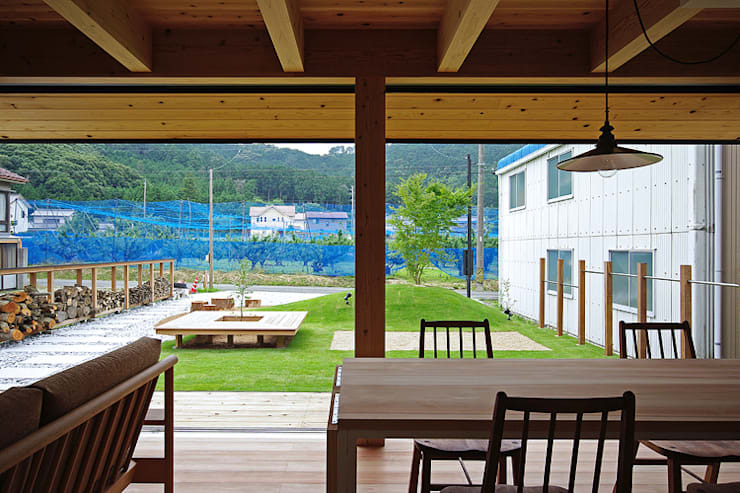 But the modern yet traditional Ishinomaki House in Aichi will force you to think otherwise. This approximately 380 square foot abode was rendered by the architects at Space Buildings, located in Japan’s Aichi Prefecture. This is a small town in the Central Honshu Island and is replete with oriental architectural delights that are traditional and simple, yet full of imaginative details and subtle nuances. 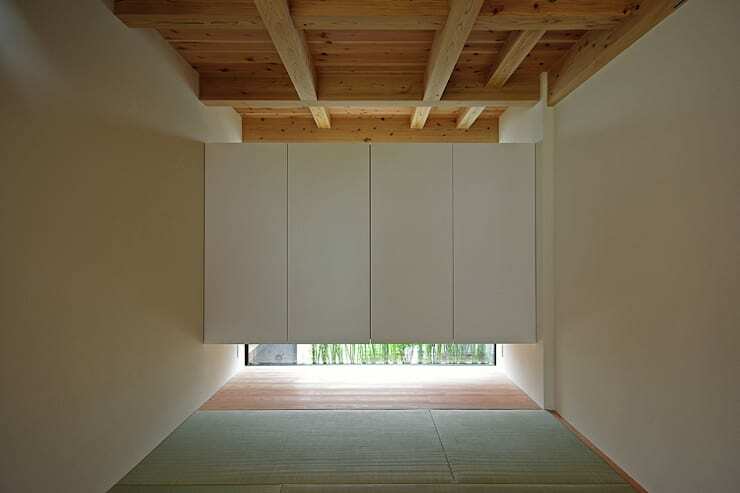 And the architects made sure that the house reflects the beauty of Japanese culture in a contemporary and smart manner. We are sure that you will fall in love with its straightforward but stylish exteriors as well as the warm and cozy interiors. The surroundings of this property are also breathtaking! So join us on a tour which will reveal more about this house. The agenda for the outdoor dining area is obvious: keep it airy and simple! By using simple lines and lavish amounts of wood, the designers have ensured that they help you reflect on the raw organic appeal of the surroundings. The frames and beams along with the simple and comfy furniture help you connect with the stunning scenery while you enjoy a cup of coffee or a hot meal. The picnic table outside is a lovely touch. 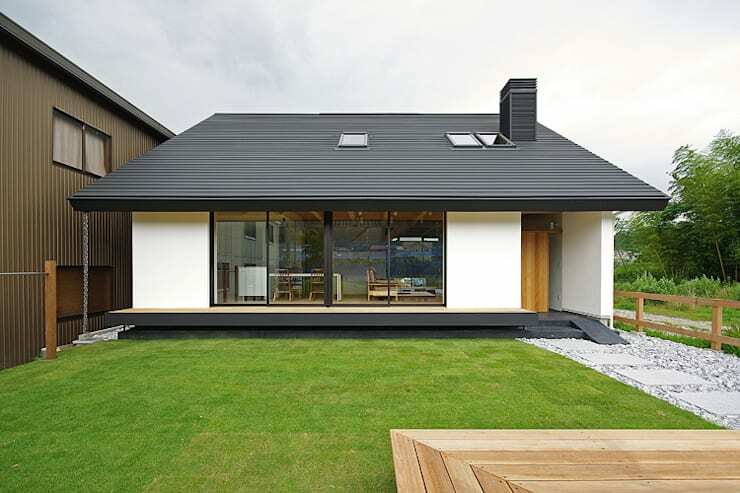 The creamy white home with its neat grey roof and compact good looks is reminiscent of conventional Japanese architecture. A slim grey deck offers the scope for casual outdoor socialisation while the glass sliding doors help in integrating nature with the interiors. Lush and manicured green lawns surround the residence while a quaint pebbled path takes you to the entryway. There is a hushed vibe and welcoming warmth here that waits to usher you inside. 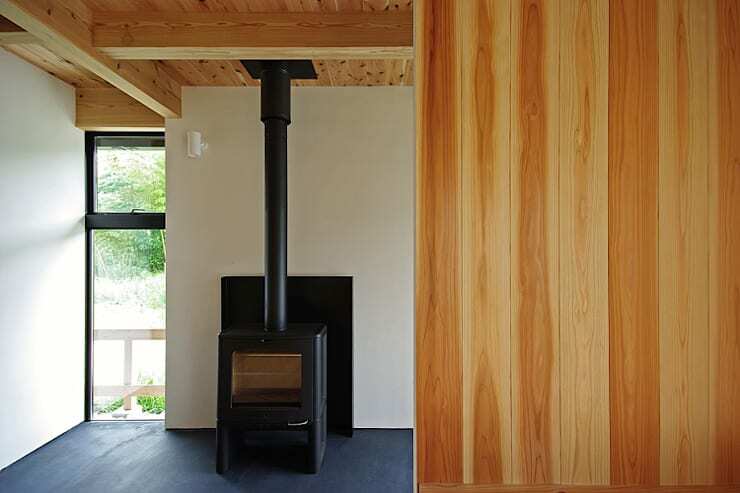 The indoors have been rendered with white walls and solid and unpolished wood which comfort the eye. This corner is our favourite, thanks to the pre-war style fireplace in its muted black metal glory. A glass panel on its left also helps put the greenery in your line of sight. While most of the home has a raw and muted appeal, this nook uses the same idea with a slightly modern twist. Fit a dining table against its floating wall of panels, or simply call it your meditation spot with greenery peeping in from below the panels – either ways, you have a winning design to play with! This bathroom is a space that will help you unwind and reflect without any hindrance. The purity of white blends with the richness of wood for a classic look. The sleek fittings and the large mirror add to the aesthetic appeal of the space. 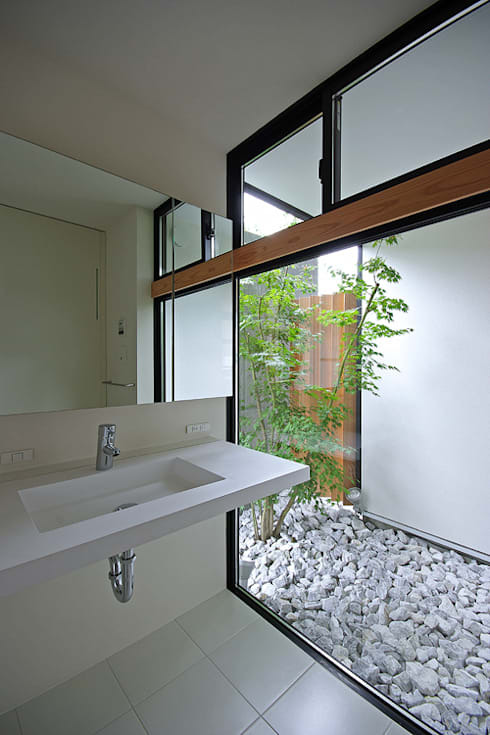 At the same time, the glass walls and the pebble beds nearby allow a Zen-like hush to settle over the bathroom! This soothing home uses the innate beauty of wood, slate, pebbles along with sober colours like white and grey to achieve a sanctuary-like atmosphere. The natural bounty surrounding the abode helps too. Take another tour for more inspiration - Grand design meets family home.